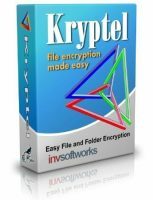 Kryptel produces not just an “encrypted file”; its files are containers that may contain thousands of files and folders. Sometimes you might want to decrypt a few files only, or just peek inside. Kryptel Browser is an Explorer-like tool, which lets you browse a Kryptel container and view or edit the files it contains. Kryptel implements the latest NIST-approved Advanced Encryption Standard; several more well-reputed ciphers are also available for advanced users. Kryptel can also work in FIPS 140-2 compliant mode, using FIPS-validated CryptoAPI encryption engine. Key blacklisted or activation limit reached.